In my last post I argued that “Glory and Gore” should be Lorde’s new single from Pure Heroine and I have two important updates. Second, “Glory and Gore” is actually going to be the next single from Pure Heroine!!! Not to gloat, but I KNEW IT!!! “Glory and Gore” will impact radio March 11th (keep your ears peeled). Perhaps when I was writing about this, Republic and Lava Records knew/was keeping track of the success of “Glory and Gore,” just as I was. When I was driving home from school today, I was actually planning on writing a post entitled “The Real Reason for the Failure of the Music Industry,” in which I would shame Republic and Lava Records for not taking “Glory and Gore”‘s recent success and growing it. In all fairness, I read in multiple sources that Lorde’s next single was intended to be “No Better,” a left over track that is on the extended version of Pure Heroine. P.S. I admire Big Machine Records for the fact that their business model puts music before business; they work with their artists and see their artists as partners, not employees (cough, cough….why they are one of the most successful independent labels…cough, cough….). I think I’ve said before that I tend to listen to music that reflects my mood, but lately I’ve been in a really weird mood that I feel is only embodied in the song “Tomorrow” by Avril Lavigne (thereby making it #PhillipsSongOfTheDay, Lavigne’s first). I used to be the kind of person that had to know literally what a song would mean; my dad and I would often go on car rides, listen to music, and analyze what a song was precisely saying (my dad is freakishly good at doing this). Recently, though, I’ve decided that I can’t digest exactly what a song is supposed to say, but I know what the song means to me. For example, I’m kind of obsessed with Lorde’s music right now; I loved the song “Team” from the first time I heard it, but I remember telling my dad on one of our car rides “I love this song, but I have no idea what it means.” I then thought about why I loved the song – I felt it displays a strong sense of camaraderie and sense of belonging to people who are different and stand out (people like me). I don’t know if that’s what Lorde intended, but that’s what I got from it (and that’s all that matters to me at this point). Clearly here Lavigne is espousing that she doesn’t know how she’ll get over this person or feeling, but she knows things will change in the future (as the future is a “different day”). It’s kind of an unusual song in that it’s not about breaking up with someone and it’s not about having moved on about some; it’s like you’ve been wounded, but the scab just formed and you’re not healed just yet. It’s a transitional song. Furthermore, I find “Tomorrow” to be such a beautifully composed and performed song. In particular, I think the acoustic guitar is so warm and, want for a better word, fulfilling. It just adds the right tone, a sort of rawness. Also, I think the “hey yeah yeah”‘s during the bridge are just perfect. Another reason why I’m in awe of this song is the fact that it was never a single, but it’s as though it was. I kind of feel like Avril Lavigne’s album Let Go is my generation’s album. I just remember growing up and everyone having a copy of that album and singing along to it. Whenever you mention this song or play it, people tend to know it. It’s odd, usually that only happens with singles. Like you know all Beyoncé’s or Rihanna’s hits (songs that were singles), but can you name a song of theirs that wasn’t a single but still a well known song? I can’t. It just goes to show how much success Lavigne had with Let Go, and it marks her as a great musician (at that time). So, yeah, “Tomorrow” by Avril Lavigne is #PhillipsSongOfTheDay, and here’s to hoping tomorrow things may change! You know what’s weird? If you go to Google Translate and type in “vivere una bella vita,” it translates from Italian as “live a good life,” but “vivere una vita bella” translates from Italian as “live a beautiful life.” Like, literally one word was moved and it changes the definition. I’ve only had two years of Italian in high school, so I barely know any Italian, but I like to pretend I know a lot (I’m not crazy, I’m just an Italian-American who is very proud of his ancestry and family roots). So today I was listening to Coldplay’s song “Viva La Vida” and I was like “hey, that’s Italian or something” (of course it’s not, but it sounds like it should be). I did a Google Translate to see what language it is and what it means (I was assuming it had something to do with life). According to Google, it is apparently Spanish for “live life.” So then I decided to translate it to Italian, ’cause you know I’m Italian. I then decided to change the Italian to say “Live a beautiful life” instead of “live life,” because, whatever. Anyway, when I was playing around with this I remembered the adjectives in Italian go after the subject they are describing, instead of in English where our adjectives go before our subjects (I think…it’s been like four or five-ish years since I’ve taken an Italian class). Whilst I was playing with my adjective, I noticed the translation changed from “beautiful” to “good.” And I have absolutely no idea why. If you know, let us know in the comments below (again, play nice children)! One day I will go to Italy and recite the very little Italian I know: “Fa mi uno sconto?” (“can you give me a discount”), “la creme solar (“sunscreen”…I don’t know why I would randomly say that to someone in Italy…can you just imagine, me walking up to a random stranger at a piazza and being like “sunscreen!”), and “ho mal di gola” (“I have a sore throat”). When I was a junior in high school, we had a project where we had to make some sort of satire (just like the movie Mean Girls, which is coming to its tenth anniversary…jeez, I’m getting old). There were many forms of satire we could attempt, but I ended up choosing to “mock” a popular song. Basically I had to take the melody and rhythm of some popular song and make fun of something. Obviously I chose to utilize Beyoncé’s “Halo.” Like, how hard would that be. I’m not a terrible singer or musician, I’m just not Beyoncé (sad face…sort of), and I was trying to be…make of that what you will…. Needless to say, every time I hear “Halo” I’m reminded of that disaster and I always cringe. Which is why I can only listen to Beyoncé’s music in small dosages…any prolonged listening session reminds me of the night I decided to become Beyoncé. Tonight, however, I decided to listen to “Halo” on repeat. Apparently I’m a masochist. So, I may not be Beyoncé. Who cares? I’m Phillip. And I think he’s pretty awesome. P.S. I decided to name "Halo" by Beyoncé as #PhillipsSongOfTheDay because of the above story, but also because I think Ryan Tedder did a #fab job with the production…the drum beat and piano really make the song, in addition to Beyoncé's vocal performance. I was busy writing other posts, doing homework, watching tv, and listening to music (I’m a very talented multitasker) when I decided I wanted to stop and just commend Ed Sheeran for his song “Lego House,” which should have been #PhillipsSongOfTheDay but never has. So it’s official today: “Lego House” by Ed Sheeran is #PhillipsSongOfTheDay. I was first introduced to Sheeran’s music when his Grammy nominated song “The A Team” was available on iTunes as the Free Song of the Week, and I was taken with his vocal ability (he really can hit those high notes, I saw him perform live and, man, he got really up there) and the rawness of his music. I didn’t really become a full fledged fan until I heard “Lego House,” which is just a phenomenal song, and saw him perform live. The reason “Lego House” has deserved to be #PhillipsSongOfTheDay is because it is a wholesome sounding song. From the soft guitar melody to Sheeran’s warm vocals, the song is like a tonic on a sad, rainy day. The thing that really makes this such a phenomenal song is the background vocals, which I assume are done by Sheeran. Hats off to the person(s) who engineered/created the background vocals specifically during the chorus, particularly in the lines “I’ll pick you up when you’re getting down” and “I’ll do it all for you in time.” During these lines, Sheeran’s background vocals harmonize the last word of each line (“down” and “time,” respectively) and holds it out longer than the lead vocal. I’m not entirely sure how to explain it, but if you listen for it during the chorus, you’ll pick up on it. But, whoever thought of the idea to have Sheeran hold out those words, kind of like a faint sigh, is just a genius. Pure genius. 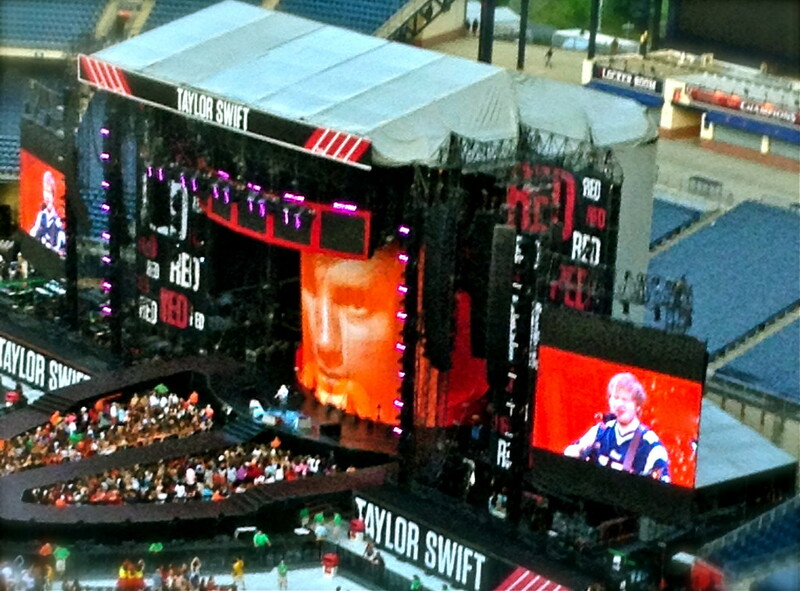 Watching Sheeran perform live was a real honor and inspiration because he performed without a band. It was just him and his guitar. It wasn’t an acoustic session; Sheeran is his own band. He uses a foot pedal to record/loop different sounds he makes on the guitar, so he would bang out a beat on his guitar, step on his foot pedal, make another sound on his guitar, step on his foot pedal, and so on. She opened the back door, stuck the yard stick into the snow, and examined it. “We’re at eleven inches” my mom said. If you’ve been following this blog since it’s beginning (hi mom! ), you probably have picked up two things: I hate the snow/cold and I live in a magical place where it currently has freezing temperatures and has been snowing like crazy. Today was weird because the weather reports weren’t too clear what was going to happen. In fact, my school insisted on staying open, then closed half way through the day realizing the weather was definitely not going to flake out. While I was working on my homework, I would casually glance out the window and just think the snow was so minimal. I’ve lived through blizzards and Northeasters where the snow is coming down; this snow just looked like a simple dusting. So when my mom said it had snowed eleven inches I didn’t think anything of it, for some reason the number meant nothing to me. Then I actually went outside to shovel. Well, now is when I was shocked how much it snowed. The snow was up to my knees. My freakin’ knees. It was me and my small shovel versus a sea monster of snow. Gulp. I’m going to regret saying this, and if you ever mention it I will deny this, but I kind of like shoveling snow (cue gasps). It’s just a great opportunity to plug the headphones in and jam to music while getting a good workout. I typically create playlists of songs to jam to while shoveling (check out my post “You’re Snow Shoveling Playlist“), but today I listened to one song: “We Can’t Stop” by Miley Cyrus. Mocking me, taunting me, that’s what this snow and winter has been doing to me. It’s like mother nature knows how much I hate winter that she has decided to make each winter the most painful and annoying. Well, just a heads up to the snow, in a couple of months it will be summer and you will be melted while I’ll be the one outside celebrating. So, there. Why is that Harry Potter Book There? The other day, my friend and I had a discussion about why Harry Potter is considered a children’s book and not an adult book, given the rather lengthy nature of the prose, the darker themes (Rowling said once in an interview that her mother’s death was “splashed” across all the pages), and the violence (particularly in Deathly Hallows) in the books. Ultimately we concluded that the magical environment of the Harry Potter books sort of align with fairy tales and could, rather lamely, be considered “childish.” We did, however, argue with this conclusion given that other fantasy/science fiction books, like The Hunger Games and Game of Thrones, were classified as either young adult or adult even though they held magical/fantasy elements. So what kind of book are the Harry Potter books? “My friend and I have been having a debate on whether Harry Potter is a children’s book, and, since you’re the children’s librarian, I want to know why,” I boldly stated. “So, for example, The Hunger Games books are young adult books because Suzanne Collins wrote it for young adults, and even though the violence level should make it an adult book?” I asked. “Okay, ” I said, trying to catch her off guard, “but don’t forget the books are incredibly long, arguably longer than most adult books. Even her writing style, word choice, and descriptions are more adult style. A lot of people think the books progress to be very dark and violent. Like, why is Game of Thrones considered adult when it takes place in a fantasy world and holds violence like Harry Potter” (if I had long hair, this is where I would flip my hair…also, I haven’t read/seen Game of Thrones, this is just what I heard about it).